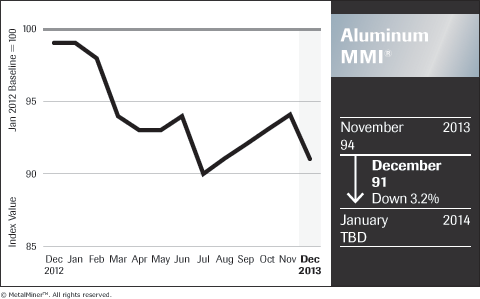 Certain indicators point to a 2014 for aluminum that looks a lot like the latest MMI trend… One of the toughest markets to read direction for has been aluminum and next year, consumers will not be pleased to hear that it does not look much better. In most other markets, massive over-supply would result in prices falling to the point where marginal suppliers throw in the towel and supply becomes constrained sufficiently to support a recovery in prices. Market economics, if you like, come into play and balance out supply at or above breakeven. Not so in the aluminum industry since the financial crisis. Massive overproduction, predicated on the back of strong growth in demand earlier this decade - growth, incidentally, that has continued in positive territory in spite of the financial crisis - has continued to bring new capacity on-stream even as loss-making older plants have been shut down. What has been different about aluminum's story compared to most other metals is that a black hole has been largely swallowing up the excess production, creating enough demand to support prices around the marginal cost of production. By "marginal cost," we don't mean the LME price, but the LME + Physical delivery premium as displayed by the MW Ingot premium, the FOB Rotterdam premium, or the CIF Japan premium. That has reached as high as $250/ton this year and effectively provides a sales price of over $2,000/metric ton to smelters whether they sell at spot or on contract. The big question is, will this premium continue next year? With such a massive over-supply of metal, there is little to lift the LME price. It has been range-bound this year around $1,800/ton, trading down to the low $1,700s and up towards $1,900 with support around $1,770 or so. Without the $200-250/ton physical premium, this would be low enough to promote widespread smelter closures - closures that few would argue are not badly needed for the long-term health of the industry - but, with the premium, smelters have survived and even increased production. According to a report by FastMarkets and brokers Sucden, in the first eight months of 2013, primary global aluminum production recorded by the International Aluminum Institute (IAI), including data for China, was 32.901 million tons, up 3.9% on the 31.672 million tons produced in the same 2012 period. The daily average rate of production in the January-August period was 135,438 tons, which was higher than the 130,583 tons per day seen over 2012 as a whole. Where the growth is coming from, though, is another matter.